In the popular Crime Scene Investigation (CSI) TV series (Las Vegas, New York and Miami) a common scene involves the injection of an unknown material into a GC-MS while obtaining an answer in a minute or so about what is the material. However, current GC-MS abilities are far away from such a vision, in both the time needed for analysis and particularly in the fact that GC-MS produces mass chromatograms that require data analysis. Furthermore, GC-MS data analysis generates compounds identification and not any material identification since each material is composed from many compounds and no "material library" exists. Thus, it is a major analytical and forensic chemistry challenge to advance into material identification. Motivated by the Israeli police request we were given Cannabis seeds with the goal of finding a new method, based on GC-MS with Cold EI, to characterize, distinguish and identify them as Cannabis seeds and not any other type of seeds. Initial search in the literature revealed that Cannabis seeds are claimed to have "more Omega 3 and Omega 6 fatty acids than virtually any other source, including fish" and that a highly abundant fatty acid in Cannabis seeds is the doubly unsaturated linoleic acid. In addition, Cannabis seeds are claimed to contain Vitamin E.
We used the Aviv Analytical 5975-SMB GC-MS with Cold EI for the analysis and identification of the Cannabis seeds. Cannabis seeds appear as small, ~2-3 mm brown elongated balls, with somewhat hard shell and softer inside. Sample preparation was very simple and included crashing three seeds inside thin aluminum foil, moving the crashed seeds into a one ml glass vial with about 400 µL Dichloromethane (DCM) followed by ~3 min of sonication and injection of the DCM "extract" as is. We used such a simple form of sample preparation since the 5975-SMB GC-MS with Cold EI can uniquely elute all the sample compounds that are vaporized by the GC injector at 270ºC and enter the column, including the late eluters triglycerides. Keep reading to learn how the 5975-SMB GC-MS with Cold EI enables Cannabis seeds identification. Sample: DCM sonicated three crashed Cannabis seeds extract without any cleanup. He column flow rate: 5 ml/min for 9 minutes followed by flow program of 8 ml/min•min up to 30 ml/min as needed to elute the triglycerides. GC Oven: 50ºC followed by 25ºC/min to 330ºC and 3.8 min hold for total of 14 min. 5975 mass range: 50-950 amu at about 1.6 Hz scan frequency. As shown in Figure 1a below, the main mass chromatogram peaks of Cannabis seeds are of linoleic acid in the forms of its free acid and mono, di and triglyceride esters. In Figure 1a the big peak at the early elution side (5 min) is of the linoleic acid itself which is an Omega 6 acid and the last big peak at 10.1 min elution time is of the glycerol dilinoleate diglyceride. Four Cold EI mass spectra of linoleic acid and its mono, di and triglycerides are shown in figure 1b and are characterized by dominant or abundant molecular ions. Note that in standard EI free acids are usually not observed or are small and with peak tailing due to their ion source tailing and degradation, hence their analysis requires time consuming derivatization. In addition, the diglycerides and triglycerides are not amenable for standard GC-MS analysis (too big and polar) while with the 5975-SMB their analysis is easy. 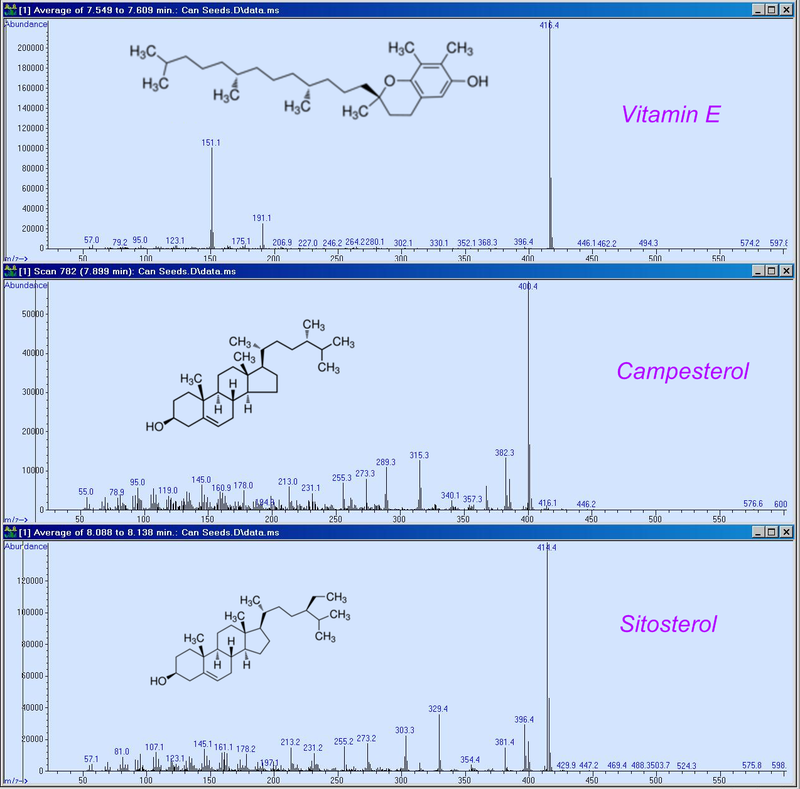 In addition, we found three highly characteristic Cannabis seeds compounds as shown in figure 2 of γ-Tocopherol (Vitamin E), Campesterol and Sitosterol, and their Cold EI mass spectra are dominated by their molecular ions in addition to a few informative high mass fragments. These compounds are rare in plants and their combination together with high abundance free linoleic acid and glycerol dilinoleate can serve as a good fingerprint to characterize and identify Cannabis seeds against other seeds or plant materials. 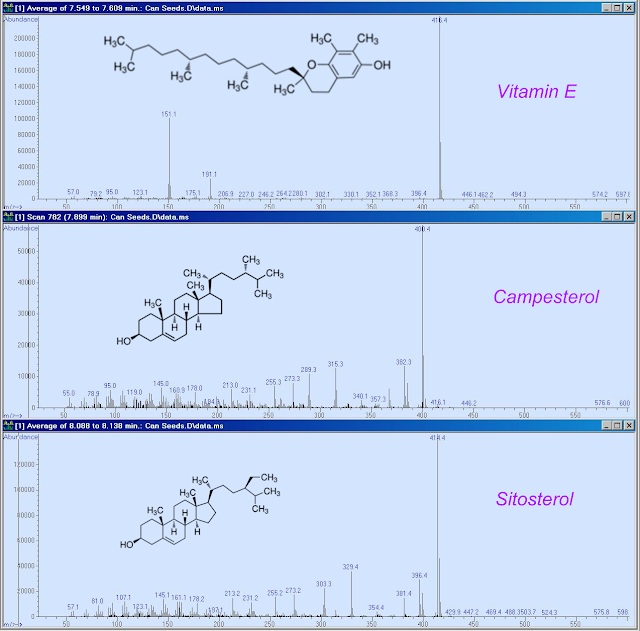 We also found other sterol compounds but Campesterol and Sitosterol were the most abundant sterols. In Figure 3 we show such 5 ions traces using reconstructed single ion monitoring mass chromatograms (RSIM) on the molecular ions of the five representative compounds. 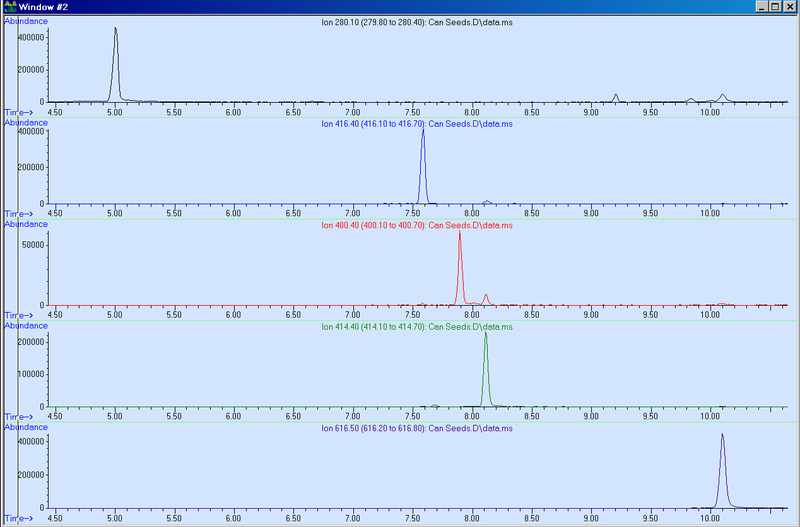 As shown, clean RSIM mass chromatograms are obtained with single tail free peak for each compound (no isomers). We note that the early elution time mass chromatogram did not exhibit any abundant specific compound while at the late elution times we found several triglycerides including a major peak of trilonolein. Finally, we also searched and found trace amounts of THC but at such low levels it can not serve for any purpose. Figure 1a. Cold EI mass chromatogram (4-10.5 min time window) of Cannabis seeds. Click on the Image to zoom. Figure 1b. 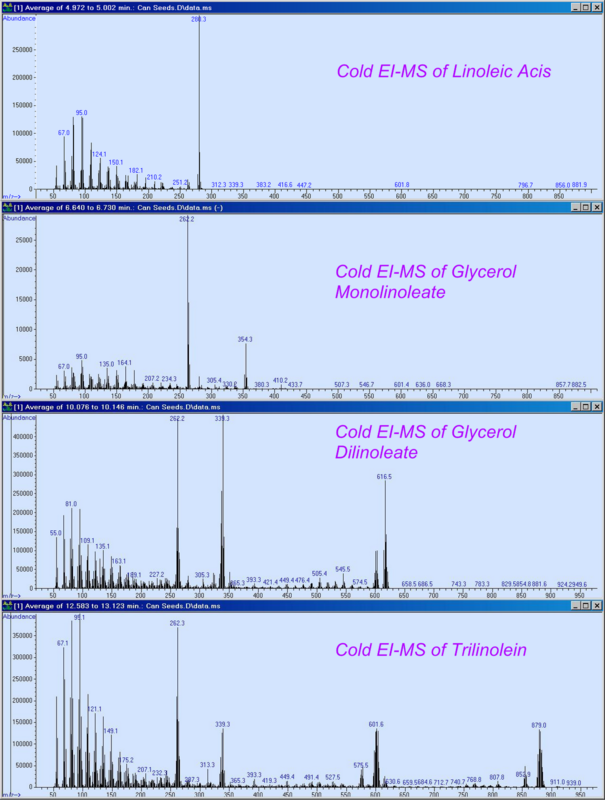 The resulting Cold EI mass spectra in order of elution of free linoleic acid, glycerol monolinoleate, glycerol dilinoleate and Trilinolein. Note the high quality Cold EI mass spectra with abundant molecular ions. Click on the Image to zoom. Figure 2a. Cannabis seeds identification via three characteristic unique compounds. The total ion count of cannabis seeds extract is shown at the upper trace in the 4-10.5 minutes elution time window. Click on the Image to zoom. Figure 2b. Cannabis seeds identification via three characteristic unique compounds. Cold EI mass spectra of γ-Tocopherol (Vitamin E, MW=416.4, upper trace), Campesterol (MW=400.4, second trace) and Sitosterol (MW=414.4, bottom trace) in their order of elution. Note the highly plant characteristic Cold EI mass spectra which exhibit dominant molecular ions plus informative high mass fragments. γ-Tocopherol (Vitamin E) seems like the most unique Cannabis seeds compound hence its presence or absence can serve as a good starting point in ruling out non-Cannabis seeds or for further Cannabis seeds identification. Click on the Image to zoom. Figure 3. 5 ions reconstructed single ion monitoring mass chromatograms (RSIM) on the molecular ions of the five representative Cannabis seeds compounds of (in order of elution), free Linoleic acid, γ-Tocopherol (Vitamin E), Campesterol, Sitosterol and Glycerol dilinoleate. 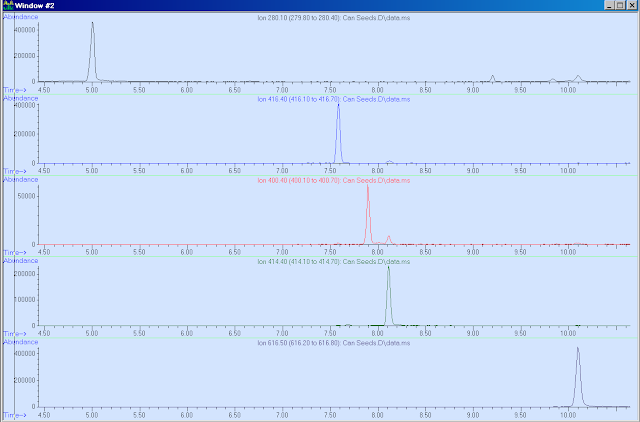 Note the obtained clean RSIM traces with single peak for each compound at their elution times. The approximate RSIM peak height ratios can serve as another indicative of Cannabis seeds. Click on the Image to zoom. Cannabis seeds were characterized and we found five compounds that can serve for its presumed unique identification. The most characteristic compound was γ-Tocopherol (Vitamin E) while linoleic acid and its various glicerides were the most abundant compounds in Cannabis seeds. The Cannabis seeds identification analysis was fast, with only 14 minutes chromatography time and few minutes sample preparation. High quality mass spectra with dominant or abundant molecular ions was obtained with Cold EI and served for much easier seeds characterization and identification. Molecular ions are exhibited for all the material (seeds) compounds. The universal availability of molecular ions enables the use of highly selective and sensitive RSIM traces of selected seeds compounds on their molecular ions to enable its unique identification. The use of short column (5 m) with high column flow rate (5-30 ml/min) enables the analysis of seeds including their large diglycerides and triglycerides constituents and also facilitates the use of crude extraction without sample clean-up as all compounds that were vaporized by the injector eluted from the column. The use of short column (5 m) with high column flow rates (5-30 ml/min) enables fast identification analysis of the seeds in only 14 minutes. This rapid analysis further contributes to make this new method more practical. The 5975-SMB GC-MS could serve to elute without derivatization large, low volatility and polar compounds beyond the limits of standard GC-MS, thereby significantly extended the range of compounds that could serve for material characterization and identification. In this application note we demonstrated the ability of Cannabis seeds identification with the 5975-SMB GC-MS with Cold EI. Obviously much more work is required to establish this method and system in order to be able to rule out false positive matching of other materials to the selected few compounds that serve for identification. This situation however is similar to compounds identification with MS-MS which does not have a library (or have very limited library) and in which the generation of few (often only 2) daughter ions serves to identify compounds without asking if other isobaric compounds can not produce the same or similar MS-MS spectra. So far we identified with our 5975-SMB GC-MS with Cold EI four materials of Beeswax , Jojoba oil, Gun cleaning oil (One Shot brand, to be published shortly) and Cannabis seeds, and all these identifications seem unique. We believe that this important area of material identification is an important future frontier in analytical and forensic chemistry and GC-MS. This is interesting work, but it seems unlikely to me that the three "unique" compounds are truly unique to the Cannabis seed. Vitamin E has a great many other plant sources, for example. It is more likely than not that these three compounds are not unique at all, and probably exist in many other types of seeds. I look forward to further research to determine whether or not that is the case. You raised an interesting point and we fully agree that much further research is required to verify our approach. However, material identification is an important future frontier in GC-MS.
About the concept of three of more marker compounds, it follows the by now established compound identification method via their three ions and their intensity ratios. Vitamin E in Cannabis seed is far more characteristic than initially perceived for two reasons: a) There are four Vitamin E compounds of alpha, beta, gamma and delta Tocopherol. Cannabis seeds exhibit gamma Tocopherol; b) Cannabis seeds exhibit gamma Tocopherol but does not exhibit any of the other three forms of Vitamin E thus its ratio of gamma Tocopherol to all other forms of Vitamin E is very high which seems unique to Cannabis seeds. Similarly there are several sterol compounds but Cannabis seeds exhibit mostly campesterol, more than any other sterol. As can be observed, Jojoba oil, which is made out of Jojoba seeds, has non of the four compounds that serve for Cannabis seeds identification and it exhibits a collection of unsaturated heavy esters that are not observed at all in Cannabis seeds. Accordingly, our method of four marker compounds works (even if we ignore visual characterization of the seeds), but as written above much more research is required to fully prove it and find its boundaries.